Well, gradually things are calming down, and I'm actually getting painting time! To that end, I finally motivated myself to get done something I'd been staring down for some time and trying to work up the nerve to start. I speak, of course, of the Gecko shoulderpads. 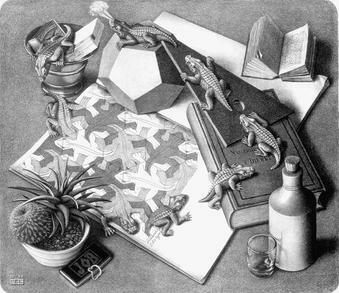 Escher's an artist I love looking at, and I had to recreate it if I could. I don't know the size of the original, but I suspect it was larger than the Gecko! The process remains, I suspect, the same: Carefully dot thinned black paint in a hex formation, after which I connected the dots with thin traced lines. This allows me to rough out where the gecko limbs need to be, and how I need to line them up. 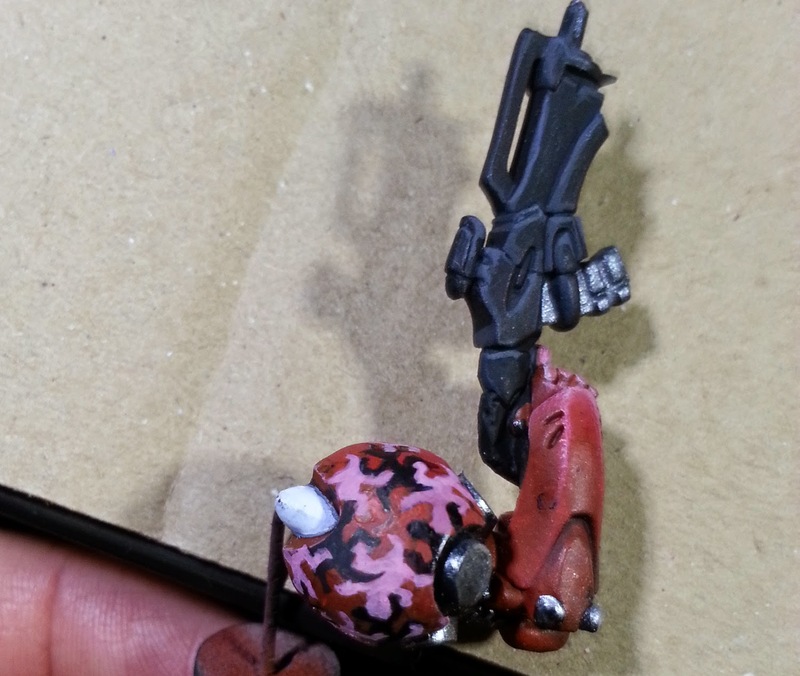 Next came a rough initial paint of the geckos. At this stage there are still a few flaws, and the paint isn't too thick, but it gives me an idea of what I need to sort out, where things will go, etc. The return of real camera! A second coat followed the first, cleaning up all the lines, thickening the paint, and getting rid of the remnants of the hex grid on the solid-red geckos. 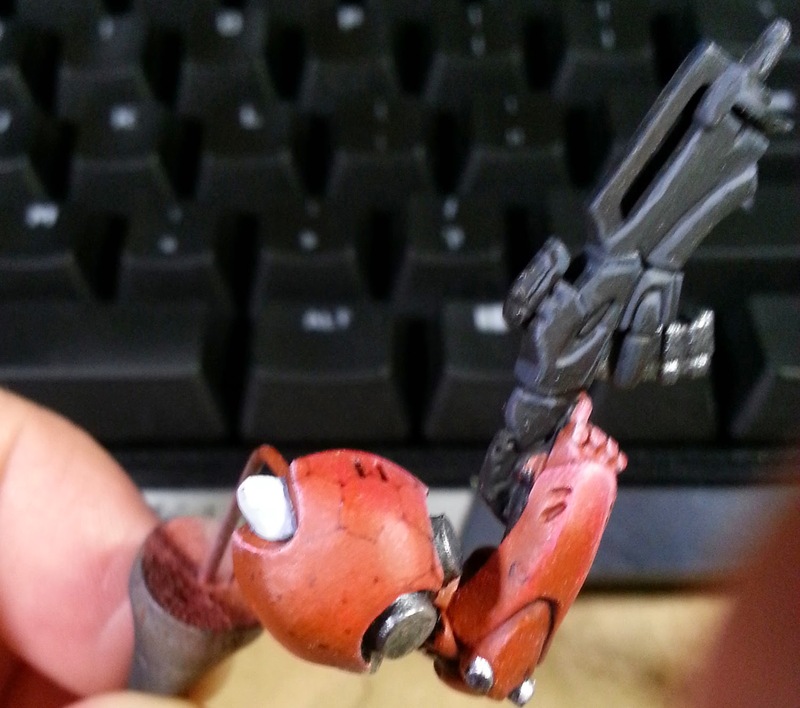 As a final step, the whole shoulderpad was hit with a coat of gloss to seal it in. I'll probably go over it with a matte finish afterwards, but for now I want to make darn sure it's not going to get chipped or marred! It was a fun if mind-bending paint, trying to remember where various limbs should go, making sure the paints were thin enough, trying to follow the lines properly. It ends up looking good though! I did have a friend ask why I wasn't doing an entire tag in this pattern, and... I think I'd just snap if I had to fit this pattern around legs and hands! Next up is the Huntress shoulderpad, which is about half done so far. I've finally settled on all four shoulder designs, so they should be along in good order!